Home » Hiking Tips » What are GPS tracks and how to use them for hiking? If you are into hiking, you have probably already heard about GPS tracks also known as GPS routes, GPS trails etc. GPS tracks are very useful for hiking as they make it simple and hassle-free to navigate on trails. A GPS track contains information about the trail such as geographical coordinates, altitude and distance. You can find GPS tracks on the internet or create them yourself. Most modern GPS-enabled devices (smartphones, GPS watches, handheld GPS devices etc.) support GPS tracks and can display them as an overlay (line) on a map – see the image on the right. If you have the GPS track for a hike and an appropriate device, navigation gets very easy – you just follow the line on the screen until you reach the destination. However, keep in mind that electronic devices tend to run out of batteries on long hikes and that GPS signal is not available everywhere. Therefore, you should always have a backup (e.g. map and a compass). In the following we will explain what GPS tracks are, how to use them for hiking and how you can create them yourself. We will also list the best resources for finding GPS tracks online. How to use GPS tracks for hiking? How to create GPS tracks? GPS tracks are files which contain data like geographical coordinates, altitude, distance and time in format such as GPX or KML which is an XML schema designed for software applications. Sounds complicated? Let’s put it in a simpler way: GPS tracks contain multiple points on the map which form a route (line) towards the destination. 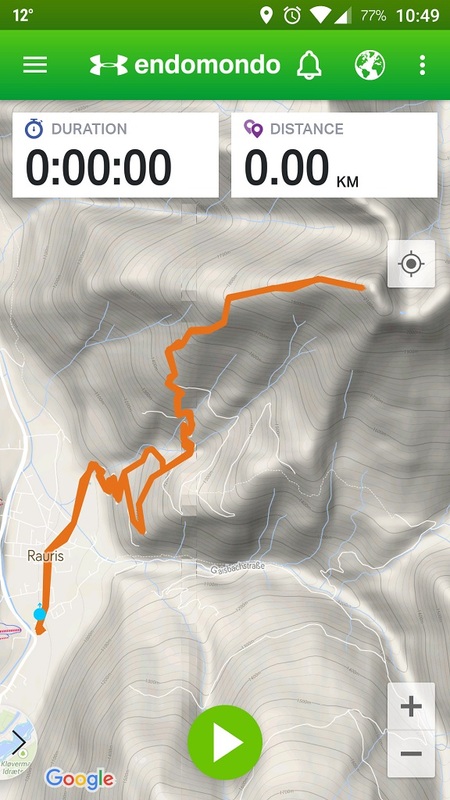 On the display of your device you can see your current location and direction in relation to the hike’s route (shown as a line). GPS tracks can be recorded with GPS-enabled devices or created with specific software. People often share GPS tracks from hikes they have completed and therefore you can easily download them from the internet to your device. Note: GPS tracks come in different formats (GPX, KML etc.). We recommend using GPS tracks in GPX format (check that the file has a gpx extension) as this format is supported by most devices. Furthermore, it usually also contains more data (altitude, distance etc.) than other formats. Once you have the right GPS track you need to transfer it to your GPS-enabled device (smartphone, handheld GPS device or GPS watch). To use GPS tracks with your smartphone, you will need an app that supports GPS tracks. Endomondo is an okay option because it comes for free and is available both for iOS and Android devices. Furthermore, many already have it installed on their smartphones. However, it has certain limitations; it requires internet connection and doesn’t support topographic maps (it uses Google maps). A better option is Gaia GPS app (available for iOS and Android) which supports topographic maps (see more here) and also works without internet connection (offline maps). However, the app doesn’t come for free; it requires a subscription which costs from $ 10 to $ 30 per year (see pricing here). Only the Green Tracks app comes with a free offline topographic map. To see more, check out the Best Hiking Apps – Test and Review. To learn how to import GPS trails to Gaia GPS app for iOS read this guide whereas importing to the Android app is covered in this guide. 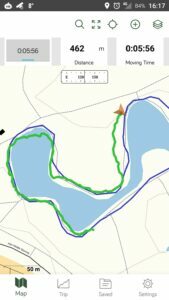 Endomondo covers the import of GPS tracks here. However, importing GPS tracks to Endomondo is a little more complicated. First you need to add a workout (import from file) and then you need to find this workout on the calendar (date when the GPS track was created). If you don’t know when the GPS track was created (you downloaded the track from the internet for example) it can be quite a hassle to find it on the calendar. After finding the track on the calendar you open it and then you should click on the arrow next to the map. Select create route and the route will be available in your Android or iOS app shortly after that. Handheld Garmin GPS devices also support GPS tracks. Importing GPS tracks to Garmin devices is very easy. First, you should connect your device to your computer using the USB cable. The computer will detect the device and open a dialog window. Select “open folder to view files” and then find the “new files” folder. The folder is sometimes hidden and therefore you should enable “show hidden folders” in your file manager. Copy the GPS track (from the internet) into this folder and then select “Courses” on the GPS device. Find the route which you just imported and select it. 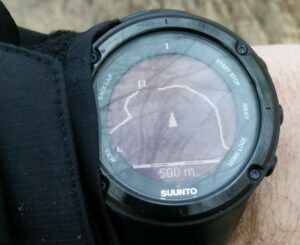 Many Suunto and Garmin GPS watches support GPS tracks; currently the Garmin Fenix series watches as well as Suunto Spartan and Ambit series watches. However, most GPS watches don’t support maps – they only show your location and direction in relation to the GPS track. This is not a problem if you are planning to stick to the track but becomes tricky if you want to wander far off the trail. However, the new Garmin Fenix 5X watch also supports maps – meaning that it shows GPS track as an overlay on a topographic map. Transferring GPS tracks to Garmin watches works in the same way as transferring GPS tracks to Garmin handheld GPS devices (see the section above). 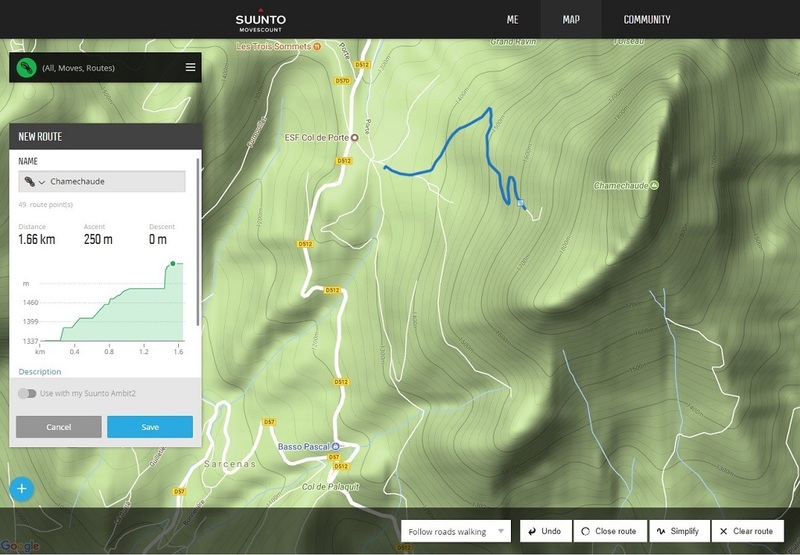 To import GPX tracks to Suunto watches you will have to use the Suunto Movescount web app. Login to the app and click on the “map”. Then click on the plus button and select import route. Save the route and sync your watch with Movescount (via Bluetooth or USB cable). Now you should be able to select the route on your watch. Resources for GPS tracks online? We have good experience getting GPS tracks for hiking on Wikiloc, Suunto Movescount and Endomondo. All three websites allow you to download GPS tracks for free and use them with whichever device you want. However, registration is required to find and download GPS tracks on the respective websites. 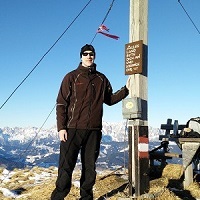 All hikes published on this website also come with GPS tracks – check out the trails section. There are two ways to create GPS tracks; you can record them with a GPS-enabled device or create them with specific software. You can record GPS tracks with a smartphone, handheld GPS device or a GPS watch (Garmin Fenix and Suunto Ambit/Spartan watches). For recording GPS tracks with a smartphone, we recommend using Endomondo or the Gaia GPS app (both described above). In both apps you can easily record GPS tracks and then export them in the GPX format. To learn how to export GPS track in Gaia GPS app check out this guide. The guide for exporting GPS tracks in the Endomondo app is available here. If you are using a handheld GPS device you need to record your activity and then save the track. Then you connect the GPS device to your computer (via USB cable) and simply transfer the file (with gpx extension) to your hard drive. Note that the GPS device will appear as an additional drive when you connect it to a computer. To export a GPS track from a Garmin or Suunto GPS watch you need to record your activity and then sync the watch with Movescount (Suunto Watches) or Garmin Connect (Garmin Watches). Then find the track in the web app and click “export”. In Movescount the export button is slightly hidden – select the right “move” and then find the “tools” button. Click the button and select export – the GPS track will be downloaded to your hard drive. 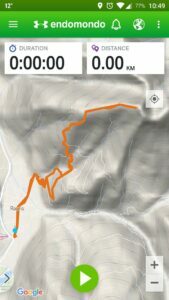 Endomondo and Suunto Movescount web apps allow you to create (draw) tracks/routes on a map and then export them in GPX format. While both web apps create valid GPX tracks, Movescount is slightly better because it also shows route’s elevation profile, supports topographic maps and has an option to automatically follow roads/trails. The downloaded GPS track can be used with any GPS device that supports GPS tracks.